We hope you came and enjoyed yourself this past Saturday, June 10th. It was great to see everyone catching up with each other before and after our meeting. We are a growing group and to help us better stay in touch ...... we now have a GMQG Membership Directory. We extend a huge "thank you" to Nancy de Jong, our Membership board member, for her time and work in making this possible. She did such an awesome job with the cover and the layout inside. I know we will all appreciate this useful "quilting" tool. For those unable to attend, Nancy will have copies for you next month. We had two wonderful, fun and inspirational ladies in our limelight this month. Our meeting was a mini Trunk Show featuring our own guild members Paige Alexander and Lynne Harrill. 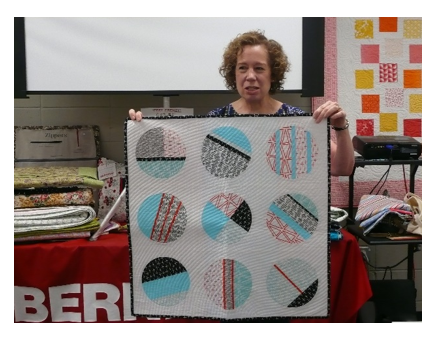 Each of these ladies shared a distinct pathway of discovery and progress as modern design quilters. I think I can safely say on the Guild's behalf that we thoroughly enjoyed their presentations. For Paige, it all began around 1979 in Mississippi where her Grandmother taught her to sew on a Singer sewing machine. Paige had a special relationship with her Grandmother. When she moved to South Carolina, she brought flower bulbs from her Grandmother's garden to plant in hers. Little did she imagine then, that it would be the inspiration for her first show quilt in 2011 called "Grandmother's Legacy of Flowers" and to this date remains her all time favorite quilt. What is next for Paige? Well, her newest work below "Positively Transparent" is going to be featured soon in a prominent place but as a full size quilt!!!! and in process, with Stash Books, is a forthcoming book co-authored with Cheryl Brickey. Left: 1983-First quilt for Aunt's newborn Right: 2011-All time favorite quilt called "Grandmother's Legacy of Flowers"
Left: 2005-Results from an ugly fabric challenge Right: 2005-Handkerchief quilt called "New Hanky's"
Left: 2014- at AQS received Honorable Mention Right: QuiltCon 2nd place for "After Dinner Mints"
Left: Modern quilt with concentric circle quilting Right: AQS 2015-Charlotte 2nd Place for "Leafy Lines"
Left: "Peak of Perfection" inspired by Pikes Peak pattern Right: 2017 - Newest work called"Positively Transparent"
For Lynne, it all began in 1977, when looking at a magazine, a quilt caught her eye. It was a log cabin pattern she would make in earth tone fabrics and hand quilt. 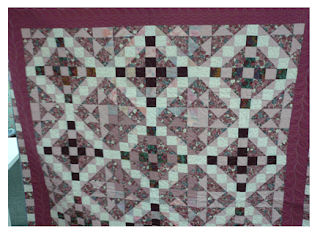 Her second quilt was inspired by a Georgia Bonesteel pattern and was also made with fabric colors of the day and amazingly hand quilted. These have become loved family quilts. The next decade would move Lynne to Georgia and Florida for her husband's work. It was in these transitions and alone-ness, she discovered something new about herself: a love of art, color, fabric dyeing and textiles. At the same time, Lynne was also becoming acquainted with the works from modern quilters (ie. Michael James, Nancy Crow....) that challenged her imagination. She made it a part of her learning experience to attend lectures, classes and workshops. 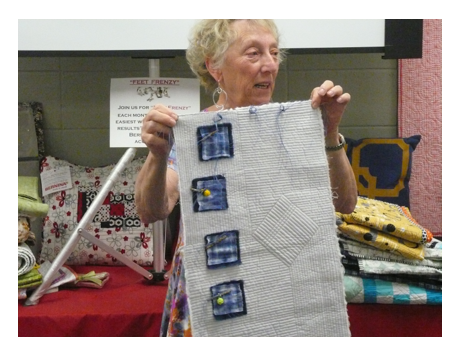 Through the years, her perseverance to explore, experiment and take chances as won her several art and quilt awards. 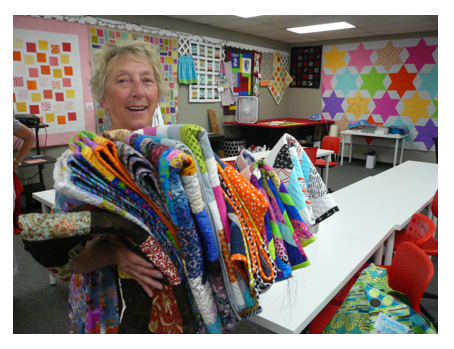 Today, Lynne exudes creativity and color. She is a textile artist. Her work shown below is a sampling of her passion for interpreting art in textiles. You can see more of her works at her website lynneharrill.weebly.com . (Left): 2001 Original quilt work called Mr. AtoZ from Star Trek (Right) 2005 Original quilt with wine glass "Fiber Glass"
Welcome to our visitors. Thank you for coming. Together with our Members we had 28 in attendance. MQG is publishing a book soon. Kudos to Cheryl Brickey and Paige Alexander who have quilts that will be featured!!!!! Check-out Bernina Sewing Center June calendar for sewing and quilting classes. 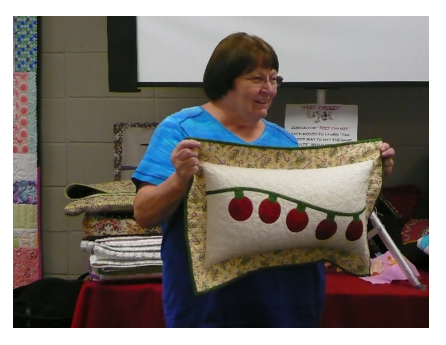 Sew-In with Cindy at: Bernina Sewing Center - Friday, July 14th from 10:00a.m. - 4:00pm. Please purchase a 1/2 yd. of fabric at Bernina for the drawing. Good job.....we had several of you test your skills. The vibrant colors look great all laying next to each other. The following are instructions with fabric colors. 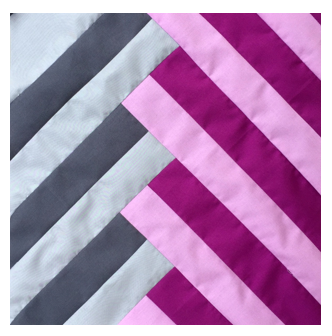 Tip: Before sewing on the final portion (portion number 9) check to make sure that you can cut a 12 1/2" x 12 1/2" block which how Alissa has portion 9 positioned. I had to move my portion 9 (so my off-set in step 6 was about 3 1/2" instead of her recommended 2") so that I could cut the full block. Look at Faye's bundle of awesome-ness!! 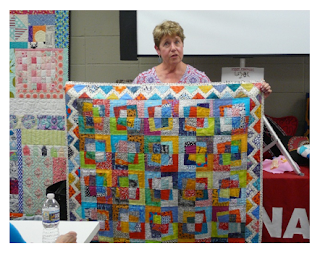 What a delight to see in Show & Share (below) the "Comfort Quilts" you brought for the children at GHS and the Julie Valentine Center. This month Faye will be able to deliver eight (8) quilts. 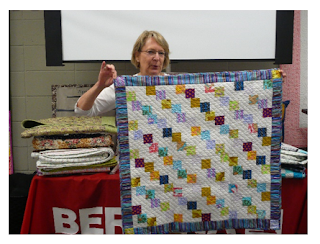 In addition, we had a queen size quilt donated that will be presented to the Greenville Habitat for Humanities. Faye expresses her thanks to each of you and to Madeline Faner for help in delivery to Habitat. 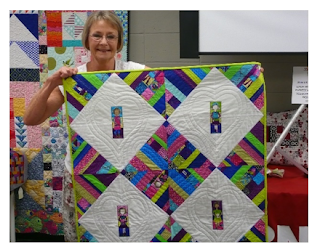 Debbie Graves-(left): Dad's quilt with remote controls called "Click, Click" & (right): quilt for a young friend "Minnons"
We have seen and admired Paige & Lynne's quilting work through the years .... and this Saturday, we have the privilege of getting to know them better. At this week's mini Trunk Show, Paige & Lynne are going to be sharing about their quest in quilting. Come be inspired. You will enjoy hearing both of their stories. 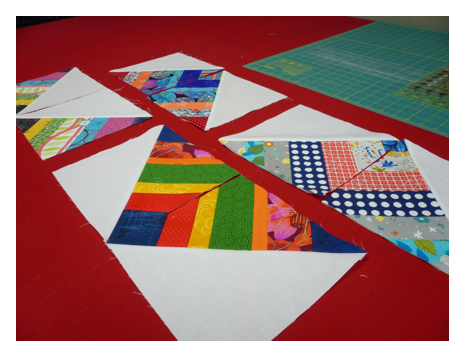 Pattern name: Birds in the Air: http://mamalovequilts.com/2013/01/tutorial-birds-in-air-quilt-block.html . Note: the interpretation of this pattern is "open" to your imagination!!! !